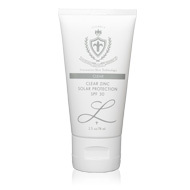 Protecting against sun damage is the most important component in maintaining healthy skin, and in preventing skin cancer. We’re pleased to offer a variety of sun protection formulated with Zinc Oxide (17 - 18%), a naturally occurring chemical compound from the mineral Zincite. Because of its unique ability to block the harmful ultraviolet rays (UVA & UVB) that cause skin cancer and sunburn, Zinc Oxide provides broader sun protection than other sun-screening agents, in addition to its natural soothing and healing properties. Zinc Oxide has been used in sun protection for decades, but wasn’t always well received due to its strong white color and uneven application. Thankfully, science has helped decrease the particle size of Zinc Oxide over time to minimize these effects. Finer particles have also dramatically enhanced the UVA & UVB blocking ability while increasing the transparency and allowing for a more even application. Sun Protecting against sun damage is the most important component in maintaining a youthful appearance and in prevention of skin cancer and age spots. 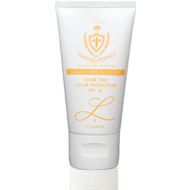 We are pleased to offer a variety of sun protection formulas with Zinc Oxide (17 - 18%), a naturally occurring chemical compound from the mineral Zincite. Because of its unique ability to block vs. screen the harmful ultraviolet rays (UVA & UVB) that cause skin cancer, age spots and sunburn, Zinc Oxide provides broader sun protection than sun screening agents, in addition to its natural soothing and healing properties. 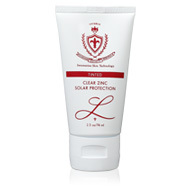 Our sunblock products are also beneficial for sensitive skin conditions such as Rosacea and Acne. Zinc Oxide has been used in sunblocks for decades, but was not always well received due to its strong white color and uneven application. Thankfully, science has helped decrease the particle size of Zinc Oxide over time to minimize these effects. Finer particles have also dramatically enhanced the UVA & UVB blocking ability while increasing the transparency and allowing for a more even application. Our sunblock products are formulated with the finest grade of zinc oxide and other gentle ingredients. See: important sun safety tips. This physical (not chemical) solar protection provides full spectrum solar protection for all climates. It’s derived from pure and high quality natural resources that help to produce the finest cosmetic quality Zinc Oxide, which also acts as an anti-irritant and anti-astringent. Massage into skin with fingertips, and re-apply as needed. Avoid eye area while applying. Massage into skin with fingertips, and re-apply as needed. Avoid eye area while applying.